Back in 1996 a Canadian company by the name of Vital Technologies Corporation released a very peculiar item. To most people this odd piece of technology which looked like a futuristic calculator must've seem like a royal rip off with a price tag of over $400.00. To Trek fans this device gave them hope about our chances of getting closer to replicating some of our favorite technbologies from the 24th century. 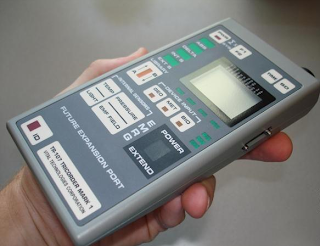 The device I'm talking about is the TR-107 TRICORDER Mark 1. This scientific instrument was marketed as the real predecessor, in both looks and function, to the fictional Mark 7 tricorders seen on Star Trek: The Next Generation. 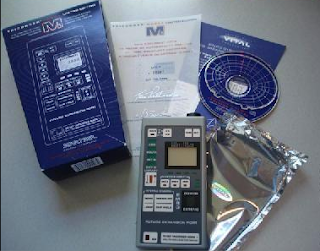 The Mark 1 offered various educational and scientific functions including an Electromagnetic Field Meter which could measure the levels of EMF radiation from multiple sources such as home appliances, electric heaters, and computer stations. According to the Mark I's promotional materials research studies show that EMFs can affect the health and well-being of humans, plants, and animals. So by utilizing this device you could detect potential health risks through radiation. Another function allowed you to predcit changes in the weather patterns through the use of the Tricorder's weather station function. This was supposed to come in handy for farmers and gardeners. 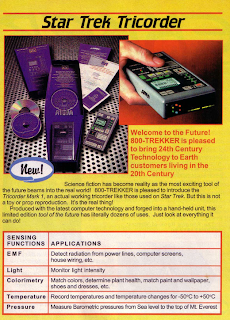 The Tricorder also offered a light meter function as well as a colorimeter which could precisely analize color values. It's kind of tough to picture this device being used on a daily basis by anyone. The device was more of a novelty in terms of scientific aplication design than a practical tool. Still it's pretty cool to think that a company put so much research and development into attempting to make a real world device based on a piece of science fiction storytelling. It reminds us once again of the impact Star Trek has had on our culture. This is really not too different than when the Trek communicator paved the way for today's modern cell phones. If you think about it the Tricorder may very well be a source of inspiration behind such devices as the iphone which includes features such as GPS navigation, communications, and even basic sensor technology. I have no doubt that in our near future a more specialized type of device will fulfill the promise of a real world Tricorder. I remember reading an article about this, but I didn't realize it read EM. Cool. Yes, it is too bad the company went out of business. Even non working mark I's have sold on ebay for over $1000. I tried to get one a few years back and was outbid every time. I have one, number 158. Still works fine. Wonder what it is worth now? I started watching TNG and DS9 during my childhood and soon became obsessed with Star Trek in general. Although my introduction to Trek was the modern shows I also love the original series and even Enterprise. I can't hate or dislike any version of Trek. This new blog is completely devoted to looking back at my favorite memories and collectibles from the Star Trek Universe.